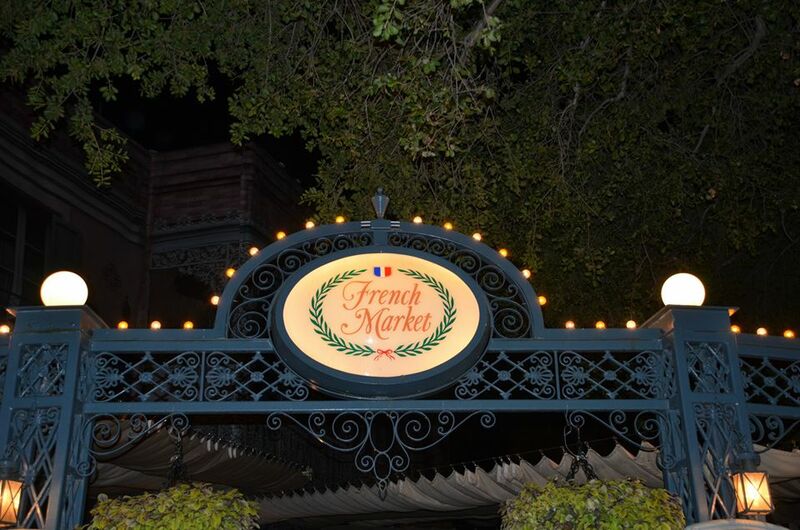 The French Market is a counter-service restaurant in Disneyland’s New Orleans Square. They serve New Orleans and Southern style of food. 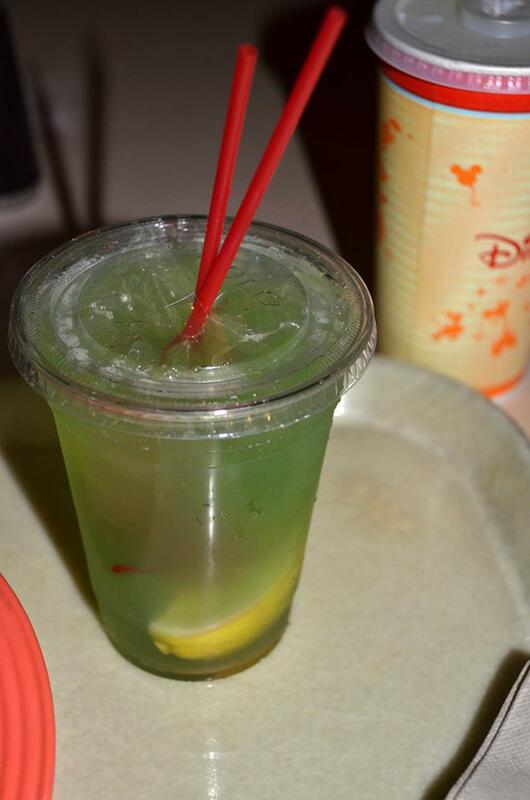 They also have the Disneyland’s famous Mint Julep (non-alcoholic). The inside of the restaurant is just a counter with no seating, as all of the seating is outside in a little courtyard. I went to French Market on our last Disneyland trip and this is my review from then. The entrance to the French Market courtyard is especially lovely if you come from the Rivers of America. 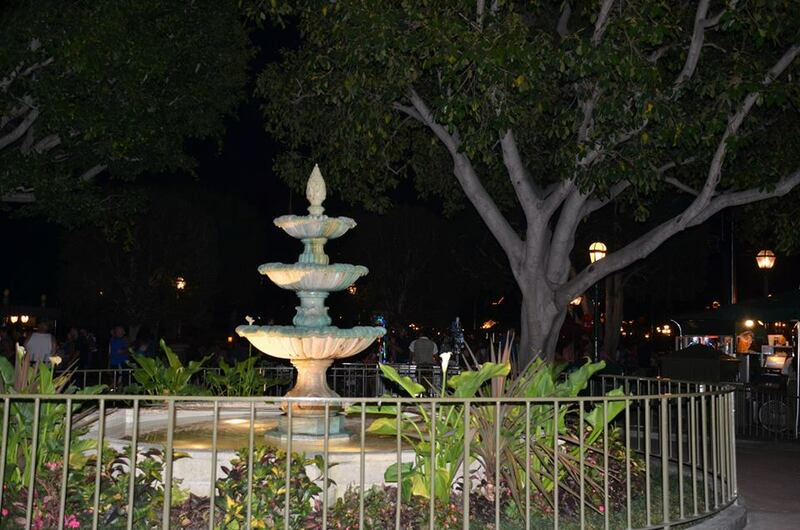 Like most of Disneyland, once the lights come on around French Market everything feels a little bit more magical. Not to mention, it’s a little easier to eat spicier food once the day cools off. As I entered the actual restaurant, it was more spacious than I thought it would be especially when you consider there is no seating inside. Typically, it looked as if they ran two sides of the counter to shuffle people through faster but, as it was late, only one side was open. I walked alongside the counter and placed my order, which was easier said than done. I love Cajun food and everything on the menu looks pretty good. 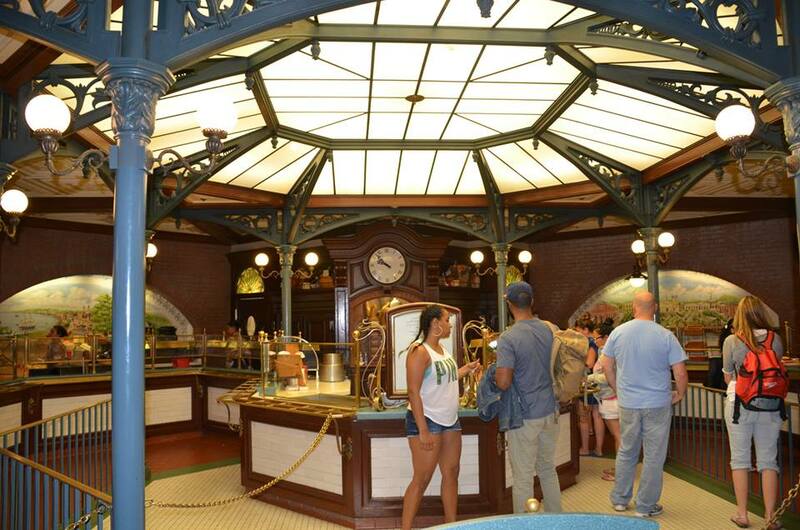 After selecting my choices, I moved to the cashier (much like other Disneyland counter-service restaurants) and paid before sitting down outside. As the restaurant was pretty empty, it was easy to find seating. I picked a spot on the edge of the seating area, looking out across the river and all the people gathering for Fantasmic! I ended up choosing the Jambalaya and a Mint Julep. 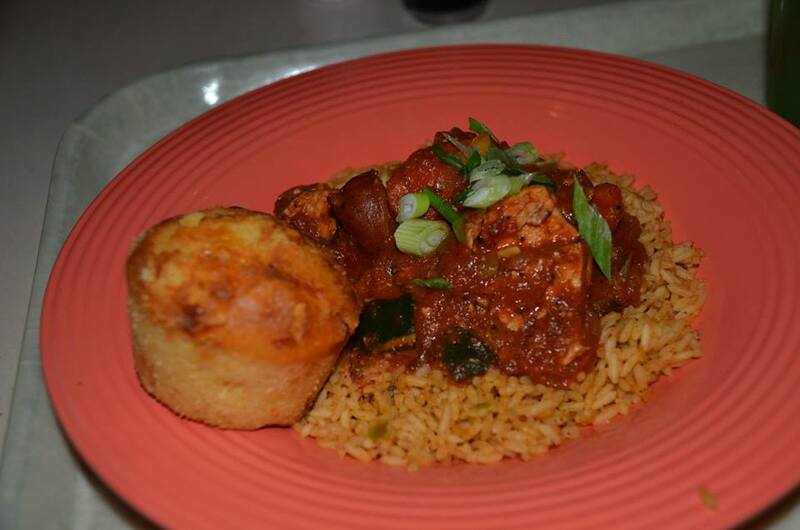 I love jambalaya as a dish and this one was good but not great. I wish there had been a little more seafood mixed in with the sausage and chicken. Also, the sauce was pretty thick and a little bit heavy on the tomato. With that being said, it was very good and had a nice kick to it. It came along with the corn bread, which was moist and helped balance the dish. All in all, I liked the dish but I’d like to try something different next time. The price for the meal wasn’t bad considering what it was and the amount of food I received. The Mint Julep was pretty good. I had never tried one at Disneyland before and it just felt right to finally have one. It was fun and I liked the initial taste but I did get a little bit tired of it by the end. I still guzzled it down to help with the spice of the jambalaya. All in all, the dish and drink went well with each other. Overall, I thought the ambiance of the restaurant was great. I also enjoyed the food but it’s not something that I’ll be raving about for years. I’m looking forward to trying something new here next visit. 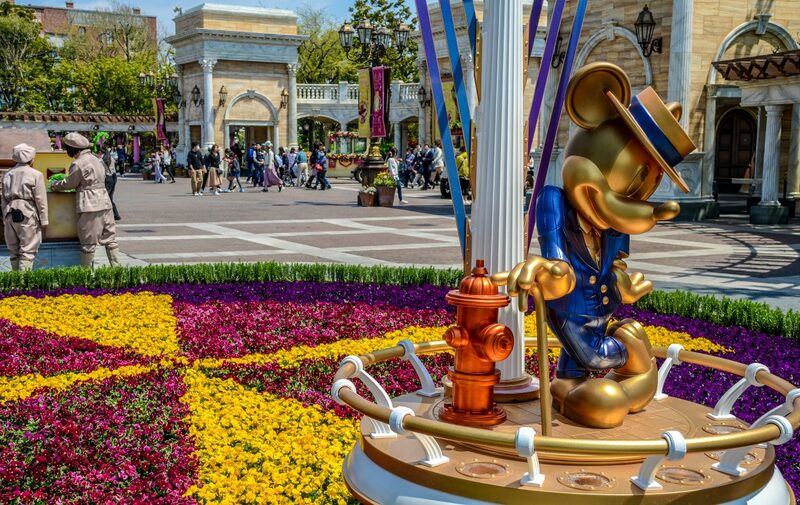 It’s a relaxing place to visit in the middle of a crowded area of the park. They also have live music here throughout the day. I enjoy French Market and will likely be back before long.